It seems I haven’t done Mailbox for some time but these are what I’ve got in the last month or so. I haven’t had much time to read either but I hope life will get back to normal soon. You bought some good books! I love historical fiction. I have my eye on The Diplomat’s Wife. Enjoy your new books. I’ve seen Jenoff’s books a lot but haven’t had the chance to read one yet. Hope you enjoy them! I’ve heard good things about Jenoff’s work but, like Mary, haven’t read any of her books yet. I hope all of your new books are winners. I’ve never heard of those authors. I hope you enjoy all your books! LOVE, LOVE, LOVE Pam Jenoff’s books. ENJOY all of your books, and have a great reading week. 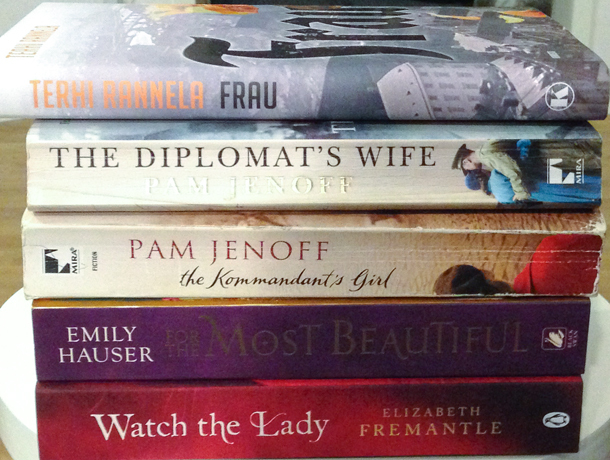 I hope you enjoy Pam Jenoff’s books. I really liked them. Great selection! I’ve heard really good things about Jenoff’s books. Hope you have a great reading week!